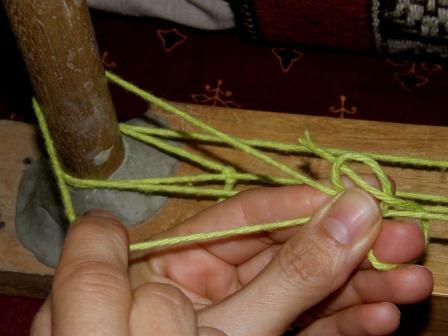 My Navajo weaving teacher taught me this knot to use when I have finished warping and want to tie off the final warp thread to the warping stake. 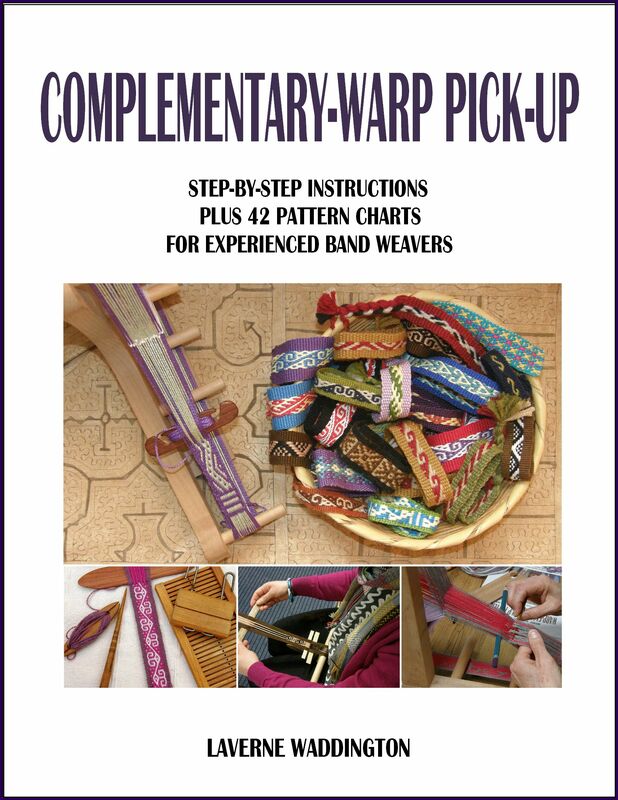 The first and final warps should be tied around the warping stake in a large loop so that the warps can be easily slipped off the stakes and onto the loom bars. This knot will allow you to tie a large loop while maintaining tension on the warp. 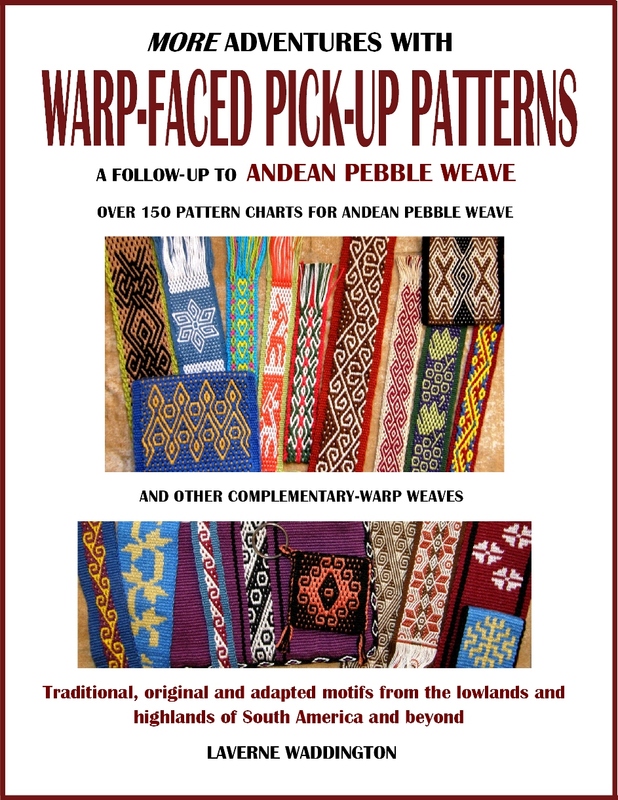 Try to tie the final warp with a lot of tension as the end warps tend to get slack as you weave. If the last warp is tied off under extra tension you may be able to avoid having to untie and retie it later. I believe that this knot is taught to scouts and guides using the rabbit, rabbit hole and tree as memory cues. 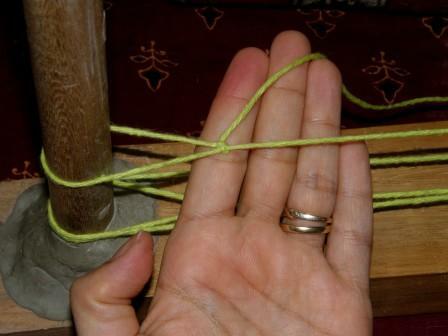 Make a loop in your warp yarn and pass the tail around the stake as shown. It doesn’t matter at this point if you let tension off the warp thread. Pinch the base of the main loop with your left hand as shown. The working end, or rabbit, comes up through the main loop, or rabbit hole. Pinch the working end in the left hand along with the main loop and then pass the tail of the working end under the static end, or tree. Form a secondary loop as you do so around one of the other fingers of your left hand. The rabbit goes under the tree and back down the rabbit hole. 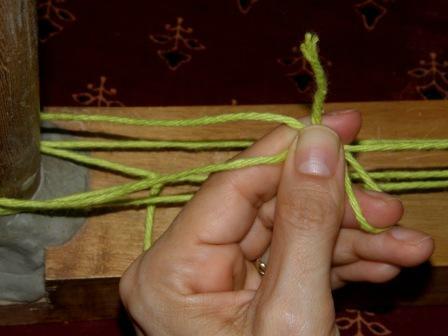 Close the main loop by pulling on the thread with the right hand as shown. Continue pinching the base of the loop with the left hand. The main loop has been completely closed. Take up slack in the warp thread now by pulling on the secondary loop and enlarging it as shown. Continue pinching with the left hand while doing so. Keep taking up slack until the warp thread is very tight. Close the secondary loop by pulling on the tail of the working end. 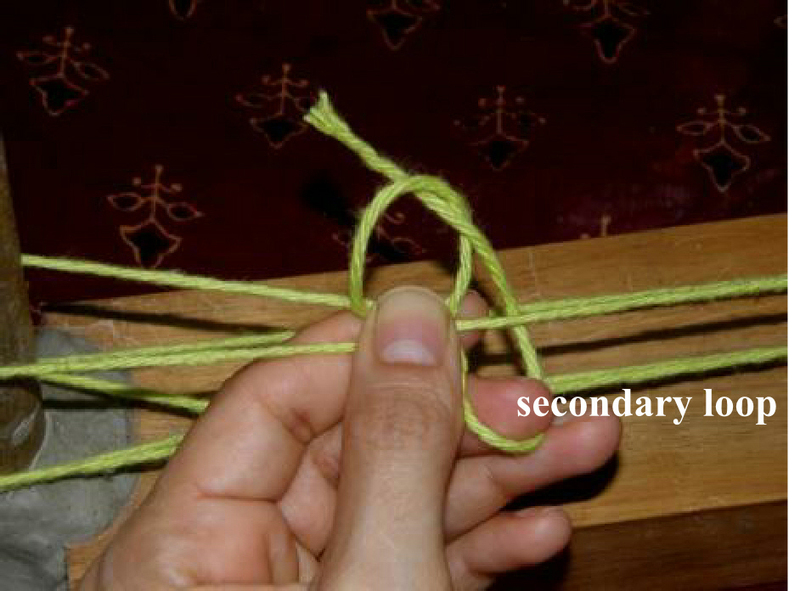 Once the secondary loop has been pulled tightly closed you can let go with your left hand and your knot is complete. 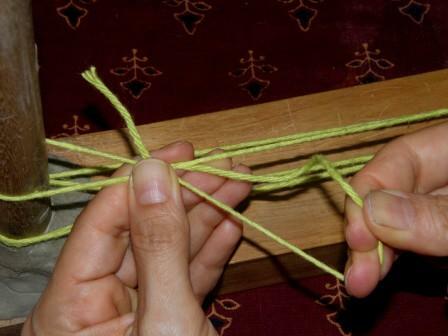 Should you need to untie this knot at any stage while weaving you will need to work a needle into it to loosen it. I’ve been studying how to tie the “Girl-Scout Knot” you mentioned to us at the Workshop at Janet Finch’s place, but we didn’t get around to having you really teach us, but I realized, that Girl-Sout Knot is really called a Bowline Knot. 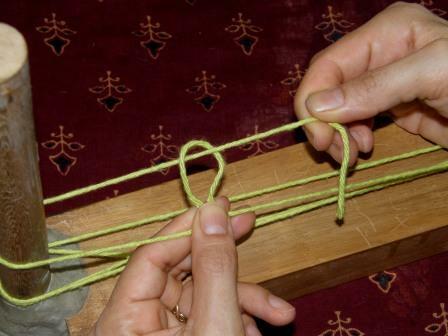 It does the same job as the Girl-Scout Knot you use when you tie on on warps. 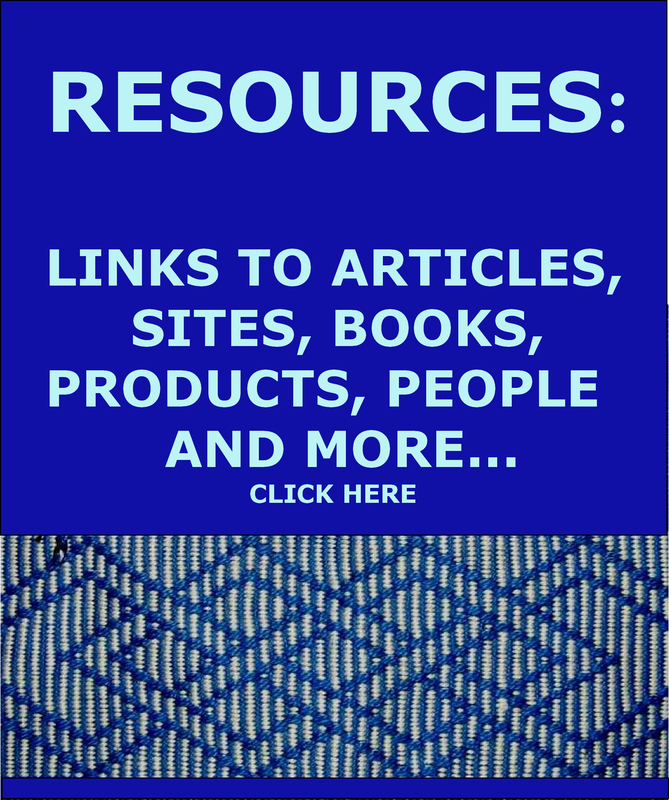 I found a website with dozens of visual methods of tying different knots commonly used. Hope you’re having fun at Linda Henderson’s place. Love the blankets you showed in your blog you slept underneath. 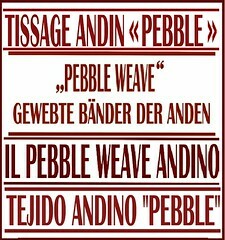 I also love that type of tapestry weaving that the North American Alaskan-Indians weave. I Love their blankets the style of their designs. 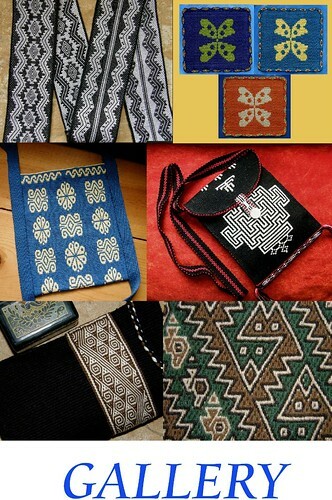 Never seen a photo of their woven piece close up like Linda purchased in Alaska. I use to thought their woven pieces were painted leather, but I couldn’t tell for sure never seeing them close up. Yes, the girl scout or rabbit-in-the-hole knot is indeed a bowline. I am glad you have found the instructions in my tutorial. For me it is the ideal way to end the warping but, as you know, we found other ways for people who don’t know that knot. 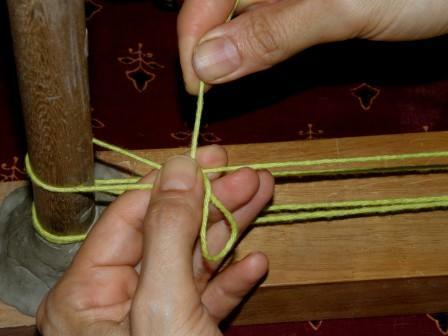 Learning to warp (especially four-stake) on top of that knot is usually too much info and so I would rather direct people to my tutorial here so they can learn the knot when they feel ready. Maybe I will do a video for it when I get home.